Credit to Bro Nay Shein Oo, Bro Kyaw Swar Thwin, Summy team, Bro Djjoe Man and original myanmar font Developers.. 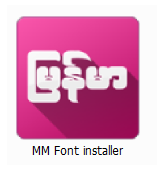 Thank you very much developer..I can see myanmar font in Galaxy S4 i9505 andrioid 4.3. Good job. Thank you so much to all developers. finally..i can use myanmar keyboard on s3 4.3..THANKS A LOT..!